Creating communities is one of the main focus in this ‘super-aged’ nation of Japan. In order to tackle issues which arise when all the people, including those with dementia, live in a community, making a new network is an urgent task. Those who work in business and government both joined the discussion and explored what institutions, corporations or individuals can do from different perspectives. By gathering those ideas and making a new network, how are we going to build a vigorous aged society? This seminar made us realize that we need connections across industries as well as possibilities of creating new communities. 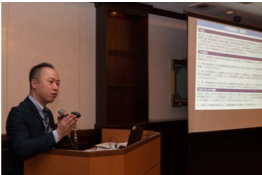 Mr. Yoshiyasu Ishii (Deputy Director, General Affairs Division, Health and Welfare Bureau for the Elderly, Ministry of Health, Labor and Welfare) made a presentation from the administrative perspective. In terms of the community support projects by the Long-term Care Insurance, the system has shifted to enrich collaboration between home health care and long-term care as well as comprehensive support for dementia. The community-based integrated care system is the consequence of building a network in the community for “self-help” and “mutual help” and businesses are strongly encouraged to provide skills and participate in network building. 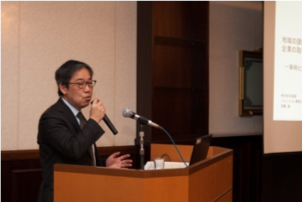 Mr. Tsukasa Kanai (Executive Fellow, Sumitomo Mitsui Trust Bank) reported that they had focused on the following three agenda items from the financial industry perspective. They increased practical training on dealing with people with dementia by actively attending the “dementia supporter training program” and also publishing the “Dementia-friendly finance guide”. All the branch offices in the nation contacted the local Community General Support Center and asked for cooperation. Provided a wide variety of products to be able to accommodate each stage of dementia. 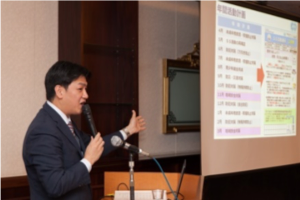 Regarding the condominium management industry, Mr. Masaki Tanaka (Deputy Manager, Research Division, Condominium Management Companies Association) reported the following. Created “Support Manual for the elderly residents in condos” and conducted a survey on actual conditions. Holding consecutive study meetings which involve experts and administrations. 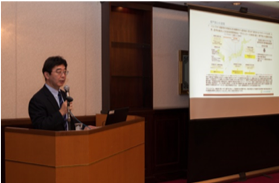 Mr. Shuhei Ikeda (Deputy Director, Public Relations Division, Seven-Eleven Japan, Member of The Committee for the Promotion of CVS Safety Station, Japan Franchise Association) talked about the Safety Station activity (SS activity). Through the SS activity, about 400 stores are commended every year for their good practices. Also, to maintain peace in the neighborhood, they protect women, children as well as the elderly. And there were 6,158 stores which prevented special fraud mostly against the elderly on more than 16,137 occasions. 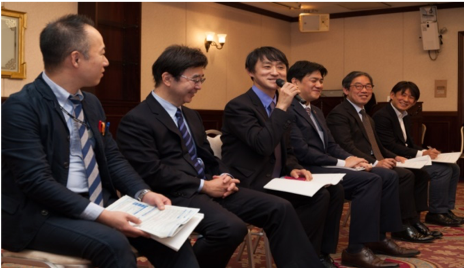 Japan Franchise Association (JFA) and municipal governments are working together to hold seminars such as “dementia supporter training program” or VR (Virtual Reality) to experience dementia. JFA is also actively hiring senior citizens. Mr. Toru Saito (Solution Director, Solution Development Center, Dentsu) presented on corporate initiatives towards solving community challenges. It is the last five years or so when media started taking up more issues on dementia. Interest on people with dementia is increasing in our everyday life but not as much in industries where they do not have to deal with them daily. For instance, transportation systems need more measures to accommodate the people with dementia. There are places like in the U.K. where some people have started to explore building a “dementia friendly” society. In Japan also, there are initiatives such as the “Dementia Cafe” or “The Restaurant of Order Mistakes” in which people with dementia serve as waiters and waitresses. Mr. Saito concluded that the parties concerned (families) should utilize the power of corporations and also include the viewpoint of social awareness when trying to build a dementia friendly society. 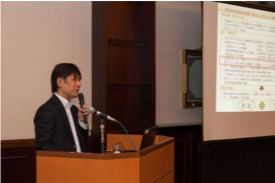 Mr. Shinji Hattori (Chief Researcher, Research Department and Deputy Manager, Research Administration Department at Institute for Health Economics and Policy) reported about municipal government initiatives. In terms of the state progress of the New Orange Plan, with collaboration from corporations, the target numbers are almost achieved by the end of fiscal year 2017 such as the number of trained dementia supporters (1,0660,000) or the number of municipal governments with a dementia cafe (about 6,000). 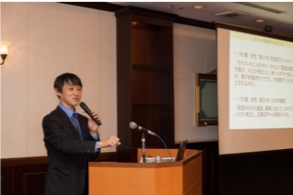 In Tokyo, they are training “administrators” and verifying the scientific effectiveness as well as promoting the care program which controls BPSD (Behavioral and Psychological Symptoms of Dementia) with discussions among care teams. They plan to expand it to the whole metropolis by 2025. Regarding “prevention”, evidence is being gathered that shows reduced risk such as people with roles in a community live longer. There is still some hesitation seen among municipal governments for partnering with corporations but it is expanding gradually. Equity becomes the issue here but advanced municipal governments are willing to partner with all the corporations that show interest. It is expected that there will be more cases down the road all over the country.